I recently created a chain style necklace that I found to be pretty popular. 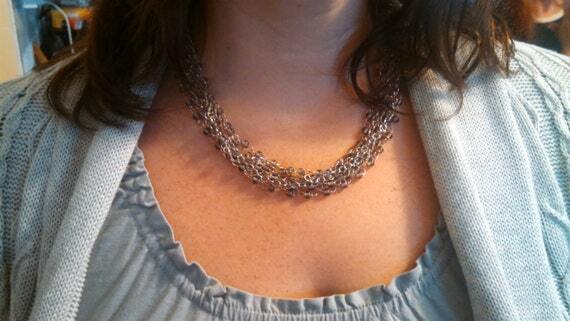 A major component that I used to make this was beaded-chain, or quick links as some people call it. I finished it up with some cone findings to give it a polished look. The wonderful part about this necklace is that you can make it in any size you want, and mix this up with any beaded-chain that you want. This is a great project for a beginner who is looking to bump up to intermediate. It will take you about an hour or so, only because I took out the guess work. Let’s get started. Beaded Chain – any color, any length. As you can see, I folded mine into quarters. You can do thirds, halves…anything depending on the size of your necklace. Primary Chain – Whatever layers you want to add on, make sure you have enough length for it. Make sure length matches beaded chain folds. Secondary Chain – You can use the same as your primary chain, but I would recommend one single strand that I very sturdy. 2 pieces of wire (20 gauge-ish), with a loop wrapped around it. Looping and wrapping this before getting started will save you troubles. Basic wire working tools – pliers, needle nose, etc. STEP ONE: Cut beaded chain and primary chain to match the same length. Take the time to be picky about this. STEP THREE: Crush the oval jump ring with pliers to make it a little more thin so the cone finding can cover it. STEP SEVEN: Cut your secondary chain as long as you would like the focal part of your necklace to hang. I would recommend no longer the just the collar bone. Swing it around the back of your neck and look at a mirror. Decide where you want the multi-chain necklace to begin. STEP NINE: Cut the secondary chain in the back. Attach a lobster claw using your last smaller jump ring. Add a larger, solid jump ring on the other side to complete the clasp set.